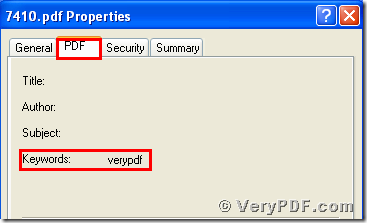 ← How to insert the paper document content to my PDF file? 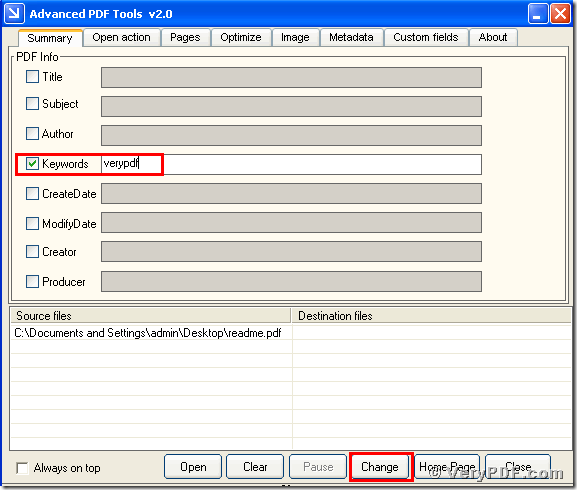 I believe that everyone who read my themes had mastered the methods about how to edit pdf file title and edit pdf file author information.Today my topic is about how to edit pdf keywords information by using the Advanced PDF Tools.You may feel puzzled that why do not tell these methods by one time.My answer is that everyday I leave a relax and simple time for you to learn this software the Advanced PDF Tools,it can not only reduce the difficulty,but also can take you a short time to learn ,so why not to describe the Advanced PDF Tools silk by chapter.Everyday just easy day for us,not so hard ,not so many pressures,you can enjoy you daily life and still feel this world become so amazing.Even if the rhythm of the modern society is so fast ,you also can come up with it. Right now ,just save a few minutes and come into this website http://www.verypdf.com/pdfinfoeditor/index.html ,please download this software the Advanced PDF Tools and install it first.Follow me ,I will give you a clue or guidance to learn how to edit pdf keywords information by using the Advanced PDF Tools.If you just my first reader this time,i will remind you that do not worry about it,it is not difficult to understand how to edit pdf keywords information by using the Advanced PDF Tools,what we need is that pay more attention for my process,operate by yourself step by step as what I tell you. 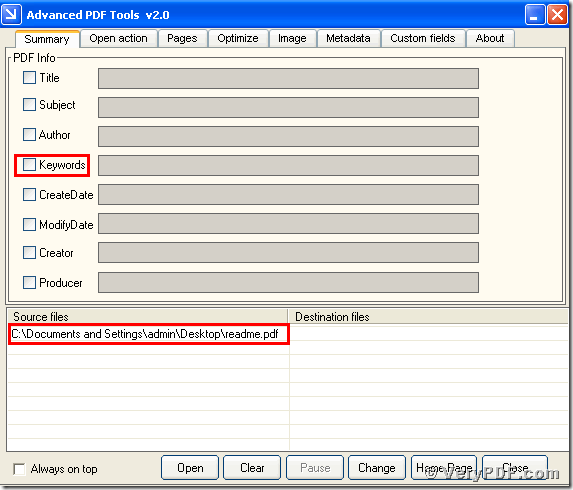 First,drag your pdf file icon into this software the Advanced PDF Tools.You need to assure that you have already running the Advanced PDF Tools.Because you must let your pdf file run in this software the Advanced PDF Tools firstly.In this case,you can edit the keywords information for your pdf file. 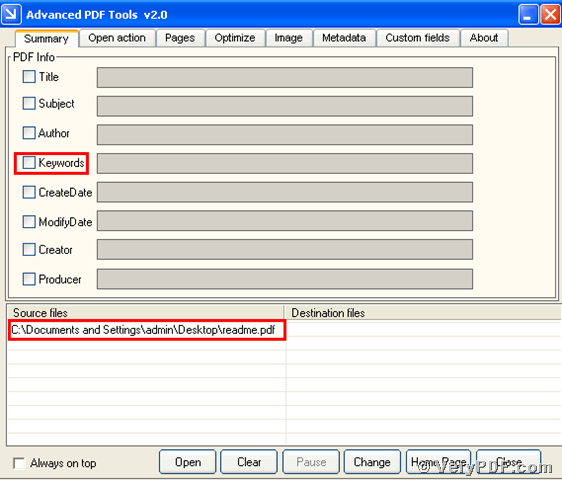 At this time ,maybe some office workers will ask me a question :“what if I put into my two pdf files and edit pdf keywords information for my two pdf files in the Advanced PDF Tools?”My answer is “of course you can edit pdf keywords information for multiple pdf files in the meantime.”This software the Advanced PDF Tools is powerful,today we just learn the tip of the iceberg for this sofware the Advanced PDF Tools.Let’s look at the image 1. 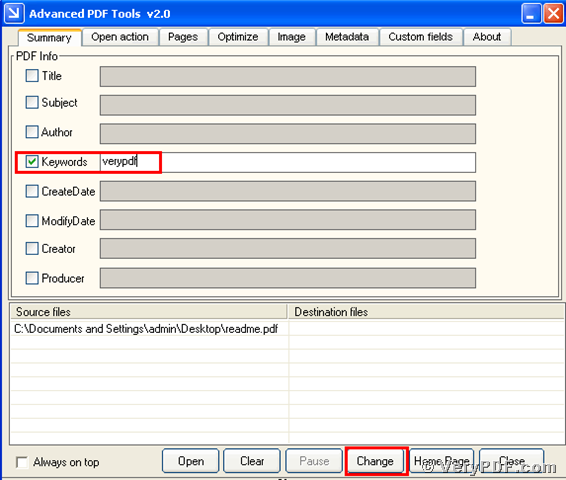 Third,put your mouse in the new pdf icon,click your right-hand key,select the “property”,then click the horizontal menu button “PDF”,you will joyful find you had edited pdf keywords by using this software the Advanced PDF Tools.Let’s look at the image 3.